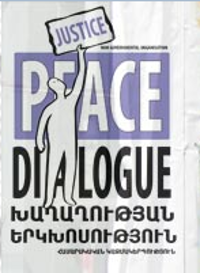 « Peace Dialogue » is an NGO registered in Armenia in 2009. It unites different peace and civil activists from Armenia, Russia, Georgia, and Germany. The vision of the organization is, through the formation of multilayer dialogue, to create a consciousness among members of society that they are responsible for peace, that they are vested with the right to demand peace from the authorities. Advocacy on behalf of victims of conflicts. Our mission is to support the active participation of civil society in the processes of peaceful conflict resolution and promotion of respectful dialogue among members of conflicting societies, with the long-term aim of contributing to peaceful regulation and prevention of new conflicts. Guided by its partners’ years of international experience in different conflicting regions and by its own local and regional studies, Peace Dialogue highlights the importance of (1) overcoming the culture of indifference and silence, (2) developing citizens’ critical and analytical thinking so that they can differentiate reality from propaganda, (3) emphasizing non-violent resistance, (4) recognizing the importance of the role and voice of the citizen, (5) promoting civilian supervision of decision-making processes, and (6) ensuring civil participation in the peaceful resolution of local, national, and regional conflicts. In the process of achieving social, economic, political, and ecological reforms, it is important for PD to utilize non-violent resistance, which is the base for the organization’s activity. Participants of the peace movement should have no other principle than achieving peace only by means of peaceful resistance. Peace Dialogue has chosen the following methods of activism to achieve its desired impacts: citizen awareness, civil disobedience, peaceful marches, the organization of campaigns, production of social advertisements, withholding of economic and political cooperation, and establishment of civilian control. The educational component is particularly important. The methods selected by the organization for developing analytical and critical skills among individuals involved in the peace movement give an opportunity to raise profoundly taboo issues, including violence and human rights violations and abuse. Methods that would create a platform for resolving those issues through non-violence have been chosen. PD staff considers dialogue between conflicting parties to be one of the most important peace-building tools. The organization’s staff believes the formation of dialogue to be the best way to ensure face to face communication wherever the communication is hampered. During their activities, it has been important to create a safe space for the representatives of the parties involved in the conflict where they could meet to shed all their stress and presuppositions. PD sees dialogue as a preliminary step for building new relations, raising one’s own needs, and discovering those of others. International: (mainly Europe), there are some activities with the involvement of activists from Middle East. Through civil engagement (the development of civil activism) Peace Dialogue promotes a culture of peace and tries to contribute to forming a global peace movement. In such a culture, everyone would understand their role and responsibility in the community and in peace acquisition and maintenance in the country and the region. Citizens would be vested with the right to demand peace from the authorities and struggle for the rule of law, social justice, and civic engagement in social and political processes. Peace Activism, Conflict Transformation, Non-violence, Human Rights, Democracy Building, Justice, Advocacy, Civic Control, Military Forces, Dialogue, Armenia, Vanadzor, Caucasus.